Have you ever stopped yourself in mid-thought, and then thought “Why am I thinking this?” Perhaps it’s an opinion, belief or understanding you’ve had that suddenly, doesn’t make sense to you anymore? Perhaps it doesn’t feel right any longer? About 14 years ago, 1-2 years after I was divorced, I was sitting in my church at mass, and I heard the priest state “…The ONLY Son of God.” And, out of the blue…I thought “What?” How can Jesus Christ be the ONLY Son of God, when WE are also told we are ALL Sons and Daughters of God? Suddenly, I thought to myself…”this doesn’t make sense anymore.” If you know me now, you know I believe in many different, spiritual teachers spiritual entities and deities, including Christ and more. I believe we all have the Divine within us, and are all a fraction of this Divine energy, therefore, all connected to each other as One. To me, it’s all about spirituality and oneness, learning to work with each other with our unique gifts. Anyway, what’s very interesting to me as I look back upon that experience, is how did I not challenge that belief before that specific time? I grew up with religion, astrology and metaphysical understandings in my life. Yet, it was that moment in time, when my life had a very profound shift in my beliefs. I was on autopilot at church! I had been accepting what the Catholic Church told me as my Truth without question. Before this moment, I had challenged the marriage contract where my belief was “it should not be broken.” I believed that with my whole being, which caused me a lot of stress. A very wise woman asked me “if he is not honoring the contract, why are you?” My ex-husband (not to take his inventory for those who may be offended by my next words), abused drugs and alcohol. He was hardly ever home, as since I was not accepting of his lifestyle, which was hidden from me, until we were already married, by him and his family. Once married, he stayed away from me to be with his friends who would party with him. He had talked himself into saying it was okay to be doing coke because he worked long hours and he needed to stay awake. Basically, he really wasn’t participating in the marriage. Anyway, when I challenged the marriage contract, I was still rather upset and nervous about it, as I am a person of my word. My wise counselor helped, but what really helped was when we told my Grandma. By, “we”, I mean my mother and I. My Mom thought my Grandma would be super upset due to her religious beliefs. But, we were very surprised by what she said. She told me “honey, if he isn’t being good to you, and you aren’t happy, then you do what makes you happy.” It was like someone took the shackles off my mind surrounding marriage. Now, I also believe people should try to work out their differences, and we both had went to counseling, however, in my circumstance, it didn’t bring us help, but helped me start to heal. So, I am sitting in church, with my sudden revelation, and also felt free of being a hypocrite sitting there, a divorced woman. I was no longer some pariah, or feeling as though I should be shunned, as women have been through-out history for divorce, or being “tossed out” by their husband. And we, as women, carry this around in our energy from previous lifetimes and our ancestors. I’ve released many of this now through working with my personal Akashic Records, and releasing with Reiki and other energy work. Talk about Freedom! I walked out that day and felt very happy. I haven’t returned to a formal church sermon since then, although I know they can bring lots of good to people. I loved the singing, and the community, but I was no longer vibrating at that frequency. Even prior to the revelation, I had been doing yoga, and read all sorts of alternative self-help books, had been going to Al-Anon, and absorbed as much information and knowledge as I could. I kept it up during and after the divorce. Others started noticing a huge difference in me after the divorce. They saw me as happier. I was actually radiating a pure happiness. Others had always told me they felt a calmness around me, and I made them “feel better” by just being around, but now there was a different level of it. True, I was no longer stressed by the marriage, but I was also working on healing myself, which brings upped my vibration. I have dated others and I have not yet met my Divine Partner, but each has taught me more to heal and transform myself. I know it is imperative to continue my healing journey and Divine Order and Timing will take care of the rest. Relationships are definitely a wonderful way to learn about yourself. Having an Akashic Records reading to understand contracts with people in your life is definitely a wonderful tool. I have a friend who had multiple readings with me and has cleared out a lot of karma! As once you know what the karma is about, you can use energy work, like Reiki, to remove the energy cords and blockages. The last relationship I had was one of the most powerful ones to really give me a huge energetic push to do more energy healing work on myself and receive energy work from others. I continue on my healing journey and my soul path, and am thankful of the wisdom I have gained through many different types of relationships through-out my life. If you would like assistance to release past karma, old beliefs and relationships, which no longer serve you, Please contact me for a reading or session. 15 minute free consultations are available. I’m honored to have this original blog featured on The Wellness Universe today! Some things must crumble to make space for new things. Within our lives, we have choices to let go of old, outdated beliefs, ideas, opinions, thoughts, places, people, etc. This does not mean they did not serve us in a positive way, because they did. Remember, we should always be grateful for everything and everyone in our lives, as they are part of our life lessons. It is through taking the time and effort to learn our life lessons, especially the most challenging ones, which allow us to heal and grow into a better and more beautiful version of ourselves. This also does not necessarily mean you lose something good, you have gained something even better in the experience such as wisdom, joy, peace or a myriad of others. Each time the old energy dies out, a rebirth is eminent. This rebirth has endless possibilities and opportunities for a deep & profound transformation, with the ability to create so many new, fresh circumstances in our lives, because we have become the version of ourselves which is now ready for this incredible opportunity to present itself. This also allows others to see what we have accomplished, allowing others to understand the ultimate benefits of releasing the old, and perhaps finding the courage to do it themselves. We need to let go of who we think we are due to past situations. We need to release our protective shells and our reactions we carried around with us for too long. It is past our experiences which have defined who we are, yet, when we realize we no longer wish to be defined that way, we are able to shed that layer, allowing it to crumble away, to reveal this fresher, newer and more brilliant version of ourselves. When we recognize we are not living the life we truly wish to live because we continue to carry around armor and past pains, we can let those things completely go. It does not mean it did not happen and it is not a part of who we are. It means we have been able to use the past experiences to create a better life for ourselves. This better life can entail so much, including a better relationship with ourselves to then create deeper and better relationships with others. It can allow us to live our passions as our career. It can bring us to a profound and deep understanding of life, as we detach from others’ dramas and issues, not allowing these to affect us adversely anymore. Release beliefs, opinions and habits which no longer serve our true wishes and needs. I recently realized I would eat whatever was served me, whether I liked it or not. Now, I actually like and enjoy nearly all types of foods, and have a rather large palate. However, there are items I simply do not care to eat. Fast food, for example. Or fatty meats. I am also not a fan of squash. I was taught to believe we need to be respectful of others, and part of that was being polite enough to eat whatever someone cooked for us. Yet, if we are to respect ourselves, and what we truly need, we need to speak our truth. Speaking our truth entails releasing old beliefs. I am a respectful and polite person, yet, I needed to respect myself and my bodies needs and wants. I enjoy cooking what I like to eat, but if someone doesn’t like something, I will not prepare it for them. And, that is being more respectful of others and ourselves as we find similar food items we enjoy, versus allowing the other person to think you like it, which is more of a fallacy, or a lie. Lying is not being our authentic self. We need to be our authentic self to have true happiness, peace & Love. When someone exited my life earlier this year, I felt as if my life had crumbled. I was told a new person or newness will come in. As I worked on healing myself through using my own services and others such as , Reiki, Akashic Records, Yoga, life coaching and meditation, I started to release old beliefs, opinions and habits which no longer served me. I started uncovering, releasing and healing from issues in my past and past lives. I started to awaken and transform. I am continuing to do work on myself as I have for many years, as the more we do, the more enlightened we become, as layers and layers peel away. Over the course of these past several months, I had the thought: “What if the new person is me? What if I’m the new person in my life? This new person being a more brilliant version of me?” This was the time I needed to release the “old” me and embrace the “new” me. Releasing, healing and transforming myself is bringing in many new, fresh opportunities and people into my life. Others are noticing the changes and helping me on my journey. People from the past are also helping me, seeing the renewed me. Our lives will crumble at different times bringing us new lessons. I am once again rebuilding with trust, belief & faith that whatever I encounter, receive and obtain will be to help me continue to Shine my inner Light brighter and brighter each and every day. I’d be honored to help you “Awaken a more brilliant version of you™”! Email me at heatherclang@yahoo.com for a consultation or appointment. 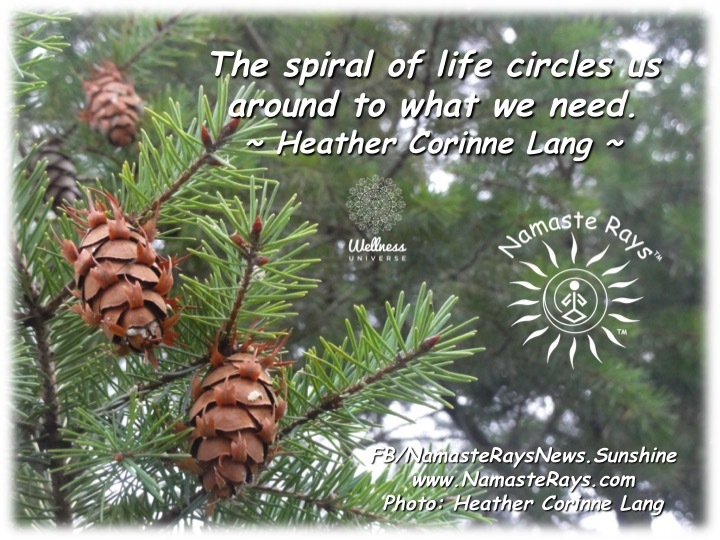 The spiral of life circles us around to what we need. We are here for our soul mission, to live as a human being, doing what we need to do to allow our soul to wholly evolve. Within life, to fully thrive, we must live and follow our soul mission & purpose through our passions, along with learning our soul lessons. Like the spiral, which all of life follows, our life spins and circles outward creating layers. These layers are either creating more resistance and stress or they are creating a deeper level of meaning in each lesson. If we are not learning our lessons or living our soul mission, resistance and stress can build with each pass, as our life spirals outward. The lesson becomes more and more important, which causes increased stress on our being & soul. This increased stress can turn into life imbalances, dis-ease, injuries and other physical manifestations. Any physical manifestation can help us understand the lesson we need to learn, as meaning exists in all of life when we take the time to listen, hear and act upon the messages’ meanings for ourselves. Spirit will nudge us the first time to get in alignment with our soul lesson, and if not learned, we will get a push, then a shove and so on. These lessons can continue for multiple lifetimes, and in one of them, we may have a physical issue we were born with, stemming from past lessons not learned. For instance with me, my spine is slightly mis-aligned, bringing in neck & shoulder discomfort, hip discomfort, as well as, discomfort between my shoulder blades. Chiropractic definitely helps, and it has for over 20 years. When I first was made very aware of the lesson I needed, I woke up to my neck feeling as if it cracked when I tried to get out of bed and it caused great pain. This led me to my first chiropractor. Many adjustments later, I do feel better and use yoga, massage and Reiki to help myself with the physical issues. However, working with yoga, Reiki and Akashic Records, I have been able to determine the root cause of the issue. I kept spiraling around the lesson, not learning it in my former lives. One lesson is about speaking my truth with my spiritual gifts, and have learned to understand I will not be persecuted in this lifetime for these gifts, the way I had been in former lives. This message comes from the neck, or throat charka. The hips are about creativity, feminine power and passions and using these inherent gifts for my soul mission in helping others. Therefore, I now use my creativity to deliver my truths in a much more balanced way with both feminine and masculine energies. In-between the shoulder blades is where the heart chakra resides, which is all about Love of self and of others and for me, it was all about expressing my emotions, versus burying them. I buried them to “be polite” and “please others”, but this was not loving myself by not being kind to myself. Expressing emotions can be done compassionately and lovingly, again part of the throat chakra lesson. I continue to work on all of these lessons, as they now deepen with other situations as they are presented to me. Making the effort to learn the lessons as our life circles outward, provides us the opportunity with each pass to create a deeper meaning or more profound lesson. This allows more lessons & healing to enter, creating further transformation & awakening, advancing our soul’s evolution in this lifetime. The lesson may come up again, telling us to go deeper and find another hidden message, a deeper truth or to strengthen the one we’ve been working on and learning. While I learned the lessons of my spinal mis-alignments, I have found deeper and more profound meanings and messages which present other aspects of these lessons with many other people in my life. Each spiral brings me another opportunity to more fully evolve into a well-balanced soul during this particular lifetime and can do the same for all of us. If you would like individual guidance during your life spiral, I would be honored to help you. Namaste! Espavo! Love & Light! If you wish to follow my blog, you will be included in the next monthly group Reiki energy session, given on the 1st of the following month. You only need to intend to be included to receive the energy when you are ready. The energy will then flow to you, helping you in any way you currently need for your soul mission. 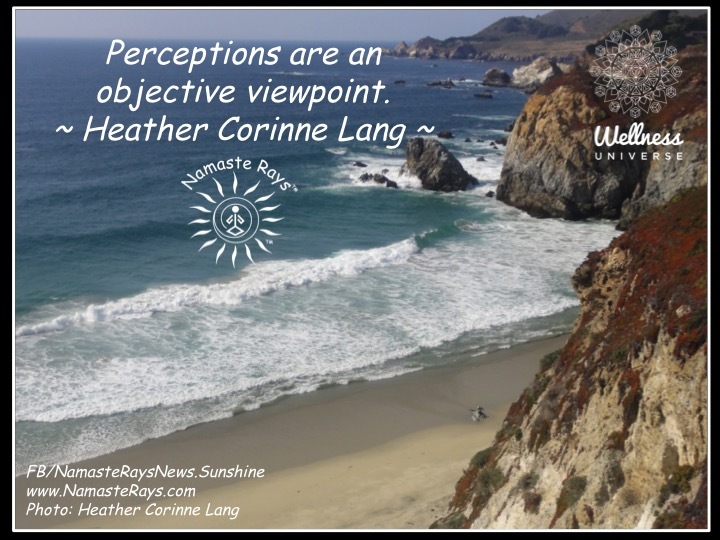 Perceptions are an objective viewpoint. Perceptions are another way of judging and they are completely objective. They are a portion of the way we see without knowing the total picture, and can happen with miscommunications or mis-hearing. They are your opinion of another person or a situation, and they are not necessarily the whole truth, or even part of the truth. Our perceptions are all dependent on us. The experiences you have been through, how others have treated you and/or how you treat others can play a role in our perceptions. Perceptions can also be a way we deal with issues when they are presented to us. Since others act like mirrors, we may be perceiving they are feeling or thinking something we would think or feel, before taking the time to discover the truth of another person. We all have our own truths, and many times we misuse them in our perceptions of others. Our truths are not necessarily another person’s truths, which we need to keep in mind in our relationships. Perceptions are also like assumptions. You are assuming something about someone else without truly attempting to understand that person or the situation. Your viewpoint is then objective and biased and not influenced by anything except your thoughts and feelings. This is an important concept to grasp when interacting with others in any fashion, as how do you truly know another’s mind, when you haven’t taken the time to get to know someone? Oftentimes, I also run into people who judge, assume and perceive others in a certain way because they don’t even comprehend their own minds enough to realize they are making these assumptions or judgements. Another way to look at it is like gossip. You hear something from someone and then talk about it, without knowing anything about what actually happened. Therefore, when we perceive something about someone, it is so very important to either leave it be, and go back to our own business, or if you are so moved, to ask the other person about how they are feeling. Remember, there is your truth, the other person’s truth, and somewhere in the middle the whole truth. Our truths are a direct result of our life journey. If you are not a trusting person, perhaps because someone hurt you in the past by breaking your trust, you may now not trust anyone, and presume people are untrustworthy. Or perhaps if you think someone is not trustworthy, it is because you yourself have judged, gossiped and/or said something in a poor fashion about another, and you are projecting your feelings onto another person. This is all how we perceive the world, and cultivate our own inner truth. By looking at how we judge, perceive and gossip about others will provide us profound lessons if we are willing to do the work, helping uncover our truths and transform them. It’s more important to understand ourselves first and foremost over jumping to conclusions about someone else. Your intuition may be telling you something about another, as well, yet we still need to use this information to first understand ourselves. Learning to understand our own inner compass, our intuition, is also an important step for our spiritual growth. Our intuition will provide us messages for our own good, yet, this doesn’t give you the right to then say something derogatory about another. Intuition comes from Divine Light, and it is intended to help us grow and learn. Understanding how you perceive another will bring you more knowledge and wisdom about yourself, helping you to ascend and transform. Therefore, it’s another way we can determine what life lessons we are needing. Plus, it allows us to be more understanding, compassionate, kind and loving to ourselves and others. And, in the end, this brings more peace and light into the world. If you are ready to begin your spiritual journey, or need more guidance on the one you’ve already started, I’d be de-LIGHT-ed to help you. Please contact me for an appointment. 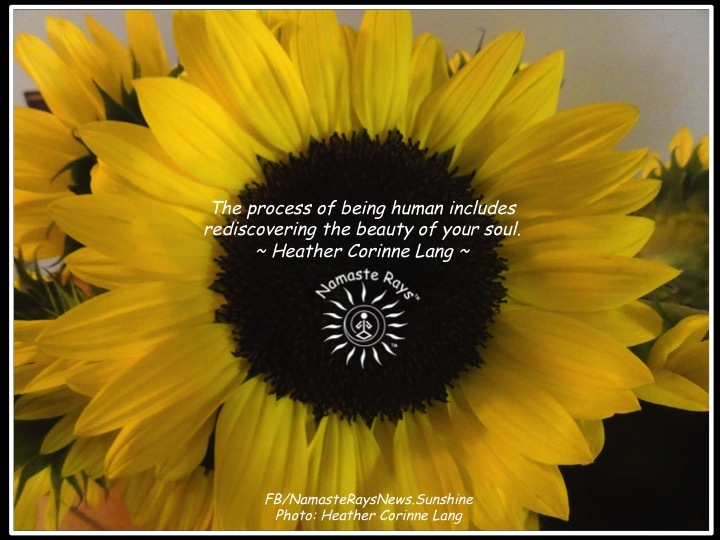 The process of being human includes rediscovering the beauty of your soul. The way we have been brought up is sometimes not in the Light of our own Souls. We may have been in situations which have caused us to douse our own Light in fear, guilt or anxiety. It may have been our family, society in general or a workplace. Or we may have simply not realized or awakened yet to the inner beauty of our inner Light. The small judgements, comparisons, criticisms or complaints we give ourselves blocks this Light. Allowing the blocks to break down includes loving kindness and compassion to our selves. It includes recognizing the beautiful gifts we have to share with others, and sharing them. It involves opening ourselves up to the beauty within us and allowing it to bloom in the world. And, this awakening brings us to the understanding, that we are but One, but we are One. One humanity, One family, One society, One world and One Light. No matter the type of difficulties or intensity of challenges you have experienced, it is to help you grow & learn. They are intended to help you rediscover your beautiful, glowing, loving soul. 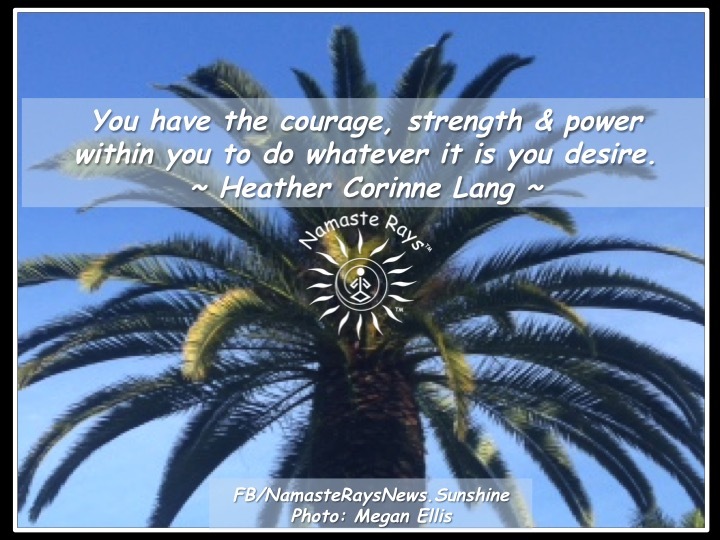 You have the courage, strength & power within you to do whatever it is you desire. Once you have discovered your true life path, you will begin to realize you have within you everything you need to create it. You have courage to step out of your comfort zone, and what you believed was a stable, but perhaps unfulfilling life. Many of us follow the paths of our parents or friends, and find we are not truly happy doing what is deemed “proper” by others. The courage turns into strength, allowing you to take the necessary steps to realize your life dreams. It may be scary, as it is stepping into the unknown, but it is also exciting as you begin to feel that joy welling up within you. Finally, your true power is revealed. This power is who you are at your core. It is the gifts and wisdom you had all along springing forth like a delighted child full of creativity and ideas, wonder and energy. Your power source is your higher self and it sings for joy as you have touched it and are now following your own internal compass. Once you realize your internal power is your divine, unique gift, that which is meant to help you in your life and to share with others, it cultivates more courage and increases your strength to move into your next phase, your new beginning and your true life path. The universe will then send you the opportunities to help you do what you need to do. It will send ideas, people, situations and resources. Note, it may not come all at once, as universe recognizes it takes time to build and will provide you with what you can handle at any given time. But, you will begin to notice how everything and everyone around you begins to be your support, your encourager and your guides. The situations and opportunities will multiple as you more fully accept this assignment your soul already agreed to do before this human life. Others may not understand, and it is not for them to understand. It is for you to understand, grasp and fully express as your true self. This enlightening and awakening is heralded and it is celebrated by the Divine, helping you to continue to use your inner power to continue your joyful, loving and wondrous life work. ESPAVO dear Ones! Espavo = I recognize the power within you and encourage you do use it for your highest good and that of the world! P.S. If you wish to uncover your divine power, please contact me for a consultation or appointment in any of my disciplines. 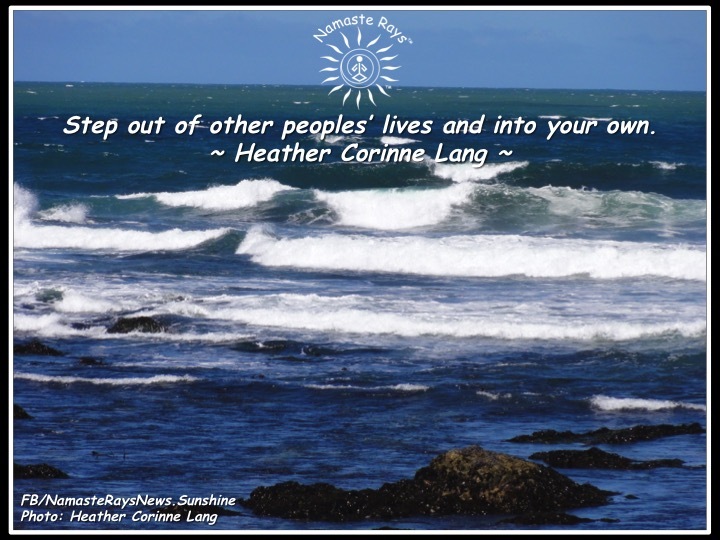 Step out of other peoples’ lives and into your own. Do not be concerned with what others are or are not doing in any given situation. Whether it’s a friend, co-worker, loved one, or for that matter a complete stranger, we must disconnect from being involved with what others are choosing to do, especially when it causes lower vibrational feelings within us. What are lower vibrational energies? Undue stress, anxiety, guilt, manipulated, fear, hurt, anger, sadness, negativity, judgement, or any other feeling which causes us to feel imbalanced or uncomfortable. When we are focusing more on others than on ourselves, we are missing the point of life, missing opportunities for growth and missing what it is our life is meant to be. Remembering we are all one, yet we walk different paths, allows us to detach from drama we may otherwise be pulled into. We are here to help others as best we can, but we are not meant to own their issues or fix their issues for them. Of course if we are fixing problems for others, we are taking away their right to learn their lessons. They may not choose to learn their lessons, and a choice is a choice. Just ensure you are not taking away their power to correct an issue, learn a lesson or miss an opportunity for growth. We are meant to do our best to guide or help someone who is asking for it, yet, disengage when our feelings start to become imbalanced. Remember, the other person needs to want to help themselves and do the work. Helping others or being concerned about others without creating havoc, worry or stress within ourselves keeps us in balance. There are many people who truly are working towards bettering themselves through growth, those who are doing what needs to be done to transform who they are, what they do and how they act and feel. If we start to feel another’s actions is lowering our vibrations, it’s time to let go and allow the other person to find their own way. Perhaps another will be able to help. Perhaps not. It is up to that person, not us. Sometimes loving and caring for another means doing it from afar without interactions with them. This is for your personal health and well-being. While you go about your daily interactions with others, ask yourself “is this my situation to deal with or theirs?” If you feel peace with the answer, you know you made the right choice. For those of us who are light workers, guides, earth angels and givers, pay special attention to how you feel when interacting with others. It is easier for us to get wrapped up in others dramas. We need to understand when we are feeling someone else’s feelings versus feeling our own. We need to fully go within and determine whether or not we are living our life, or living someone else’s. The answers we receive to help balance us and bring us back to ourselves and our paths will leave us feeling lighter, happier, balanced, peaceful and in complete harmony. Note: I’m available via phone or Skype for distance Reiki sessions, Tarot Card readings or intuitive guidance (life coaching). If you would like guidance in any of these areas, please contact me at heatherclang@yahoo.com to schedule an appointment. Investment in you: $1/minute, prepaid via PayPal. It’s the first of a new month & new year, blessed with a new moon. This moon in Capricorn is rather significant in that it’s the perfect time to start working on creating the foundation of what you want to create in your life. It’s time to ask yourself “what is it I wish to create?” Then start! Do you wish to enter a new career? Perhaps it’s time to look into schooling, loans and grants. Perhaps you wish to spend more time with loved ones. Ask yourself what you can do to create the time you wish. Do you wish to create more love in your life? Perhaps you love people, and can offer your time, volunteering in assisted living homes, hospitals or childcare. Spending time with people who do not necessarily have family or friends near them is a wondrous way to create more love in your life. Many different ways exist to create a life you desire! Do you wish to create more financial flow into your life? Ask yourself what you love to do, and work towards making that something you can do to create the financial flow! For example, I work in an office, yet, am also a yoga teacher and a Reiki Master & Teacher. This is what I’m working on creating…more classes, students & clients to both help myself & them. I’m also a life coach, which I blend with the Reiki to help you find your blockages, release anything which needs to be released & work with you to heal yourself, mind, body & soul. This is how I’m working to create something more in my life…more financial flow, more health & wellness, more love. So, work at it each and every day. 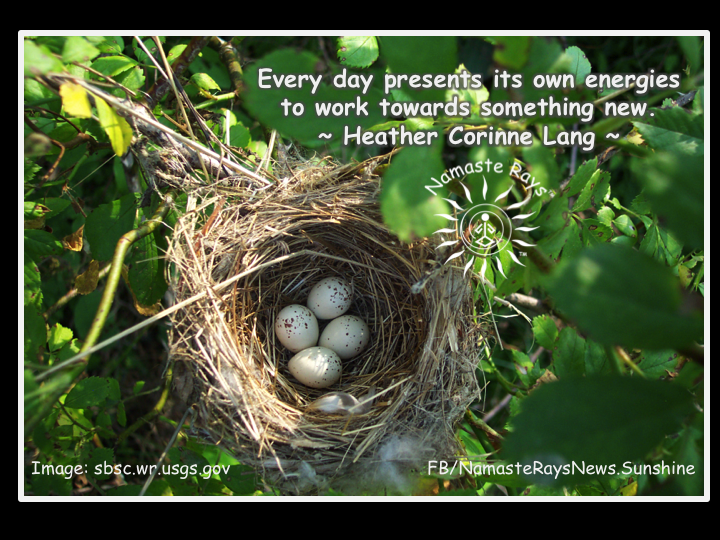 Every day presents its own energies to work towards something new. Remember, even though it’s the beginning of a new month & new year, each and every day can be the one to start anew & fresh. We are all blessed with 24 hours to work at something we really wish to do…whatever it is. This influx of energy today is special, yet, every day is special and can be used to your benefit. Feel the energies at play each day. How do you do this? Ask others how they are feeling. Look into astrology. Go within your own being and ask yourself how you feel. Then, use that energy positively to continue to build the foundation you want, and as the days progress, you will find the rest of the life you wish being built…being created…and being lived! May you use the energies of each day to build, create & live your new life!